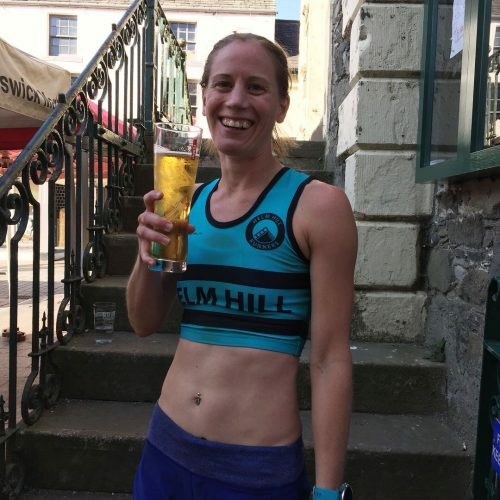 In 2018 Jenny Rice completed the challenging Frog Graham Round becoming (at that point) the fastest female to ever complete it. 40miles over the fells and through the waters of the Lake District, a navigational challenge and test of physical endurance. 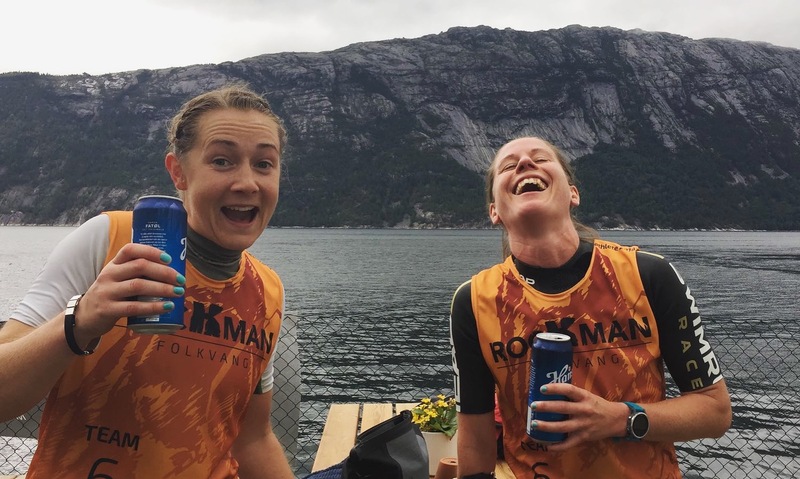 ÖTILLÖ, Breca & Rockman – finishing on the podium of many. 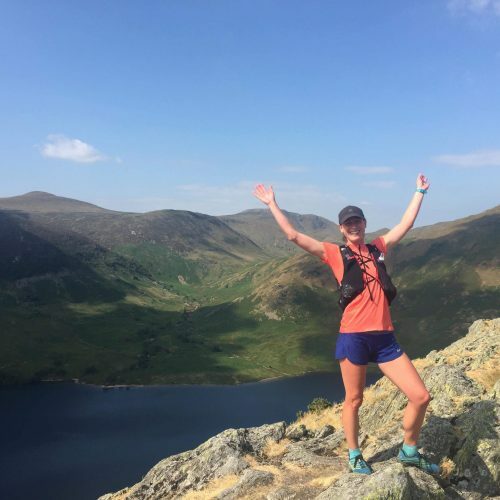 A personal inspiration to us here at WWW, we caught up with Jenny to find out how it all went, what drives her to take on such feats and what she has planned for 2019… we also went fishing for some tips on how to get started! 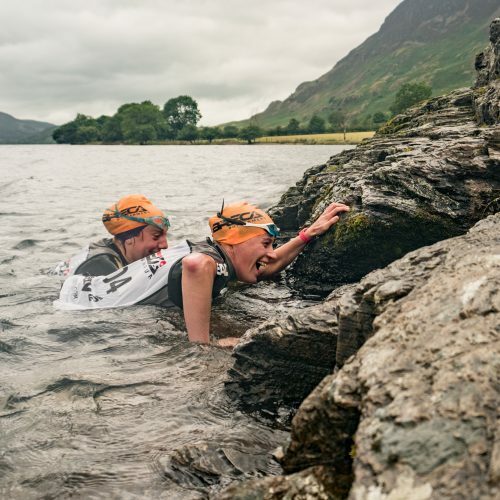 In 2018 you completed the Frog Graham Round which is described as the UK’s ultimate Swim Run Challenge – Can you tell us a little bit about the round and your journey to getting to that start line in Keswick? 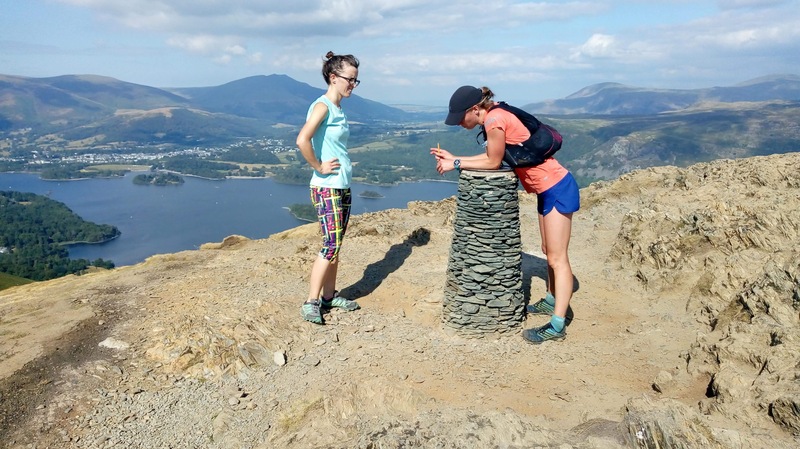 The Frog Graham Round was created by Peter Hayes (author of the awesome book ‘Swimhiking in the Lake District and North East England’) and is a 40 mile fell run with 4 swims across Bassenthwaite, Crummock Water, Buttermere and Derwent Water. 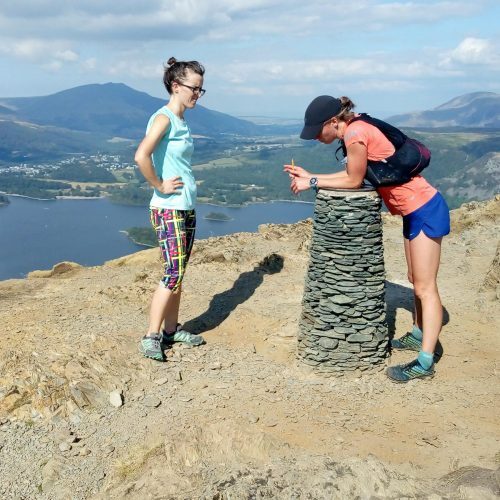 It takes its name from the Bob Graham Round, but the only similarities are the start and finish (Moot Hall in Keswick) and the first summit, Skiddaw. The route takes in 18 summits, 15,750ft ascent and approximately 2 miles of swimming. 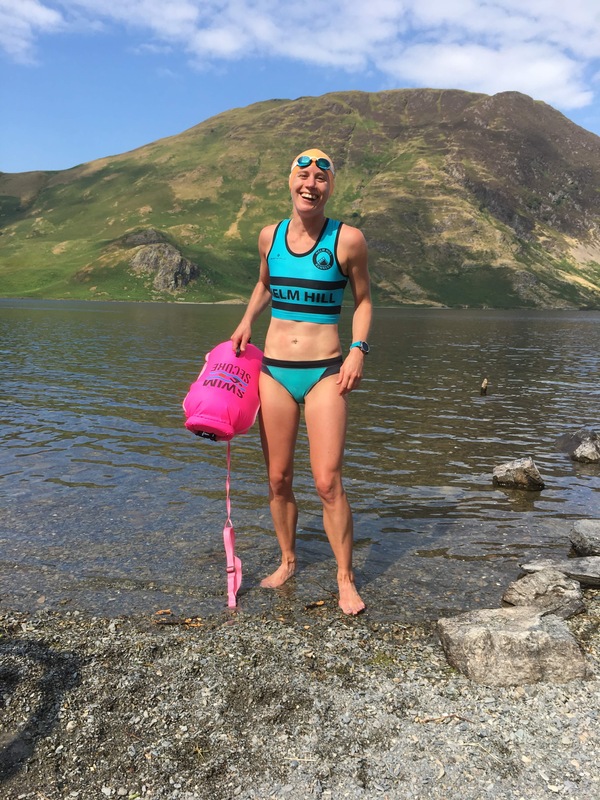 I first heard about it in 2016 and started recce’ing the route with the aim to do it that summer, but before I knew it, summer had passed, and then the next, and I’d not managed to fit it in amongst various swim runs, fell races and family weekends. 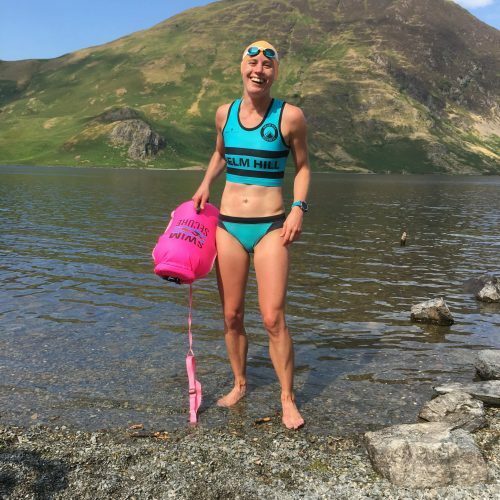 This summer, I was feeling confident about having a go – having got several long fell races under my belt, and I finally found a potential weekend that could work and the beautiful summer weather helped me make the decision to go non-wetsuit, aiming to save time, weight and faff! I was a bit scared to let people know what I was planning – I’ve only ever done races and events where I’m one of many taking part. But the idea of being the only person doing something, with people giving their time and energy to support, was really nerve-wracking. 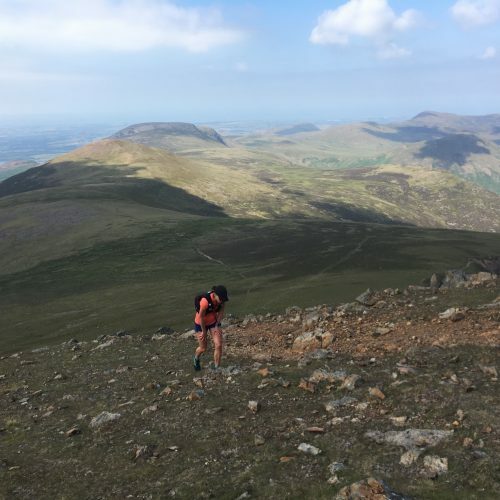 I spent evenings obsessing over and planning the time schedule, and quietly recruiting support runners for company (unlike the Bob Graham where support runners carry kit, food and drink, in the Frog you are expected to be self supported). I found coming up with a schedule quite a challenge, not really sure what time I’d be aiming for, but aware my support runners needed some sort of guide! Dan Duxbury was super helpful, having recently set the fastest time (11:52). I looked at all of his summit times on Strava, and added a few minutes to each one, coming up with my own schedule of 13:30. How did the day itself go? 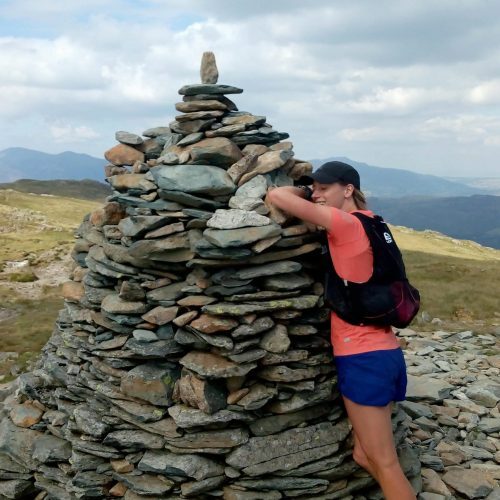 I hardly slept the night before, as much as I tried to tell myself I had nothing to worry about and that I was just going for a long day out on the fells and swimming in the lakes! My alarm went off at 3am but I was already awake. I started at Moot Hall at 4.30am with Carrie Gibson joining me on leg 1. We had about 20 minutes to kill before the start time, so played around taking photos of me wearing my swim hat, goggles and running kit. The day started perfectly with the sun coming up as we climbed up Skiddaw. Once on the summit, we dropped down to Carlside, through Dodd Wood and Mirehouse & Gardens to the small church by Bassenthwaite where we met the support duo of Scully (my husband) and Jo Wilcox. 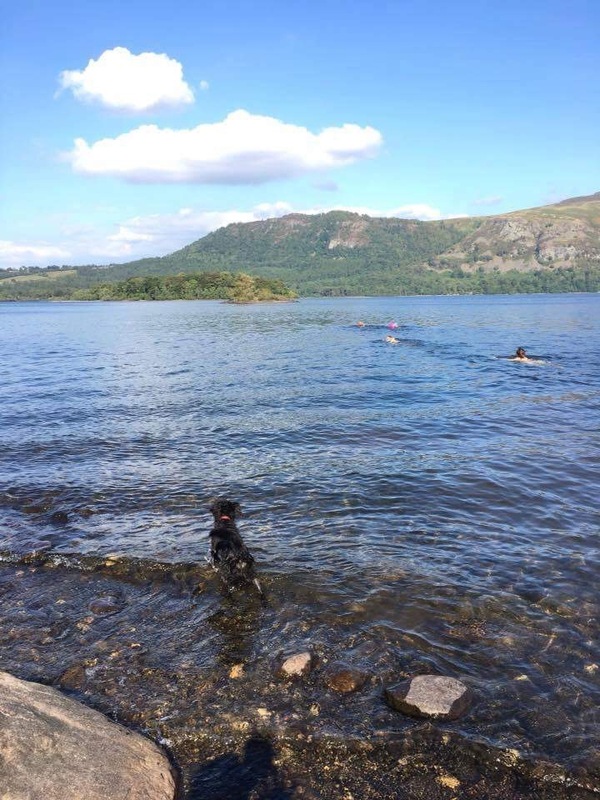 It felt really weird arriving at the lake, getting changed and leaving Carrie, Jo and Scully, as I waded into the lake and swam across to meet Keswick local, Lee Procter at Beck Wythop. I disappeared into the bushes when I got to the other side, to change into a new (Helm Hill!!) swim bikini. 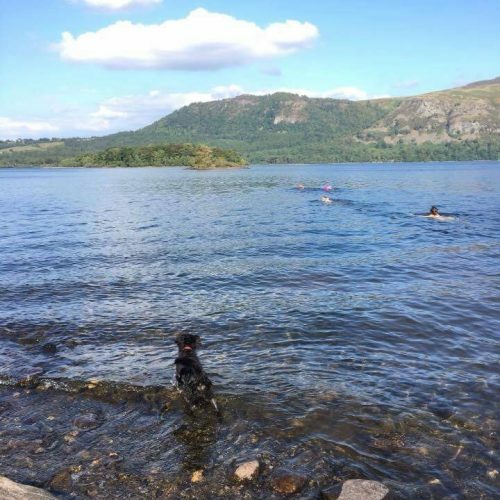 (It’s important to change whatever you swim in after Bassenthwaite to try and prevent the contamination of other lakes with invasive species). Lee had been a star that week, I’d asked him last minute to support me on the first part of leg 2 over Barf, Lords Seat and Ullister Hill, as I’d not managed to fit in a recce. He’d gone out the previous evening to check he knew where Ullister Hill was – as he’d never heard of it – taking a photo of it and sending it to Dan Duxbury to check it was the right hill (it’s a very insignificant summit!). I loved these three hills, climbing up through the woodland to Barf was beautiful, and the next two hills went swiftly by (with Lee reminding me not to go too quickly!). 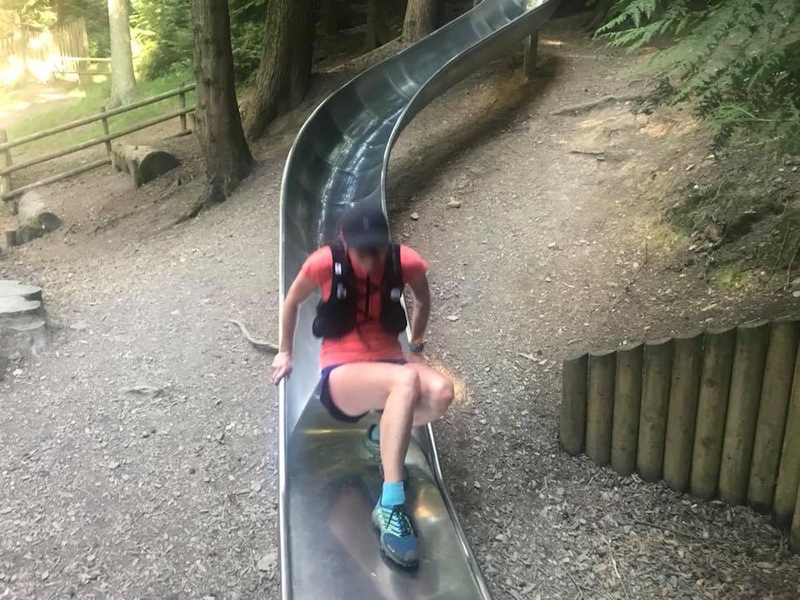 I really appreciated Lee’s local knowledge through the tracks of Whinlatter Forest, and through the playground (taking in the slide!) 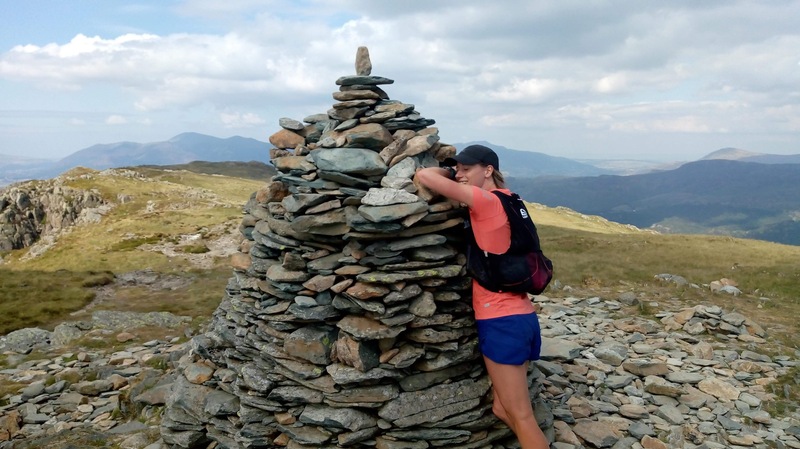 to meet Scully, Jo W and support runner 3, Jo Rycroft at the Whinlatter Visitor Centre. 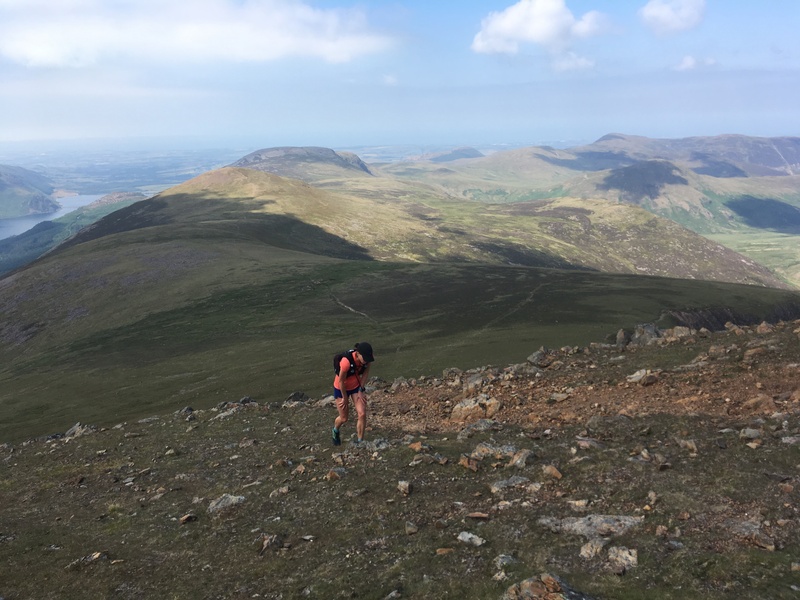 Jo R joined me on the next part of leg 2, which I felt like I knew like the back of my hand, having run the summits many times on recces and races. 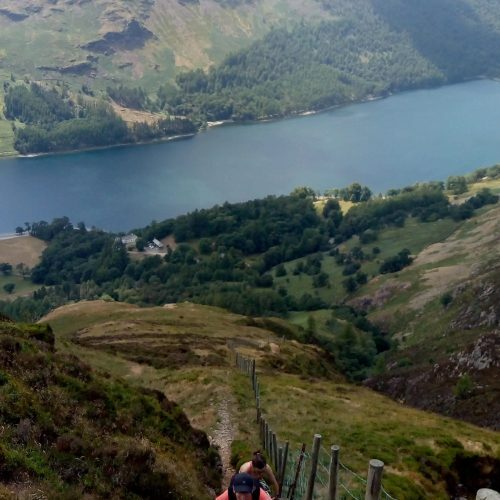 We ticked off Grisedale Pike, Hopegill Head, Eel Crag, Wandope, Whiteless Pike and Rannerdale Knotts, chatting most of the way, stopping for lots of photos, and generally having a blast. I got a little excited as we hit 20 miles in less than 6 hours, I optimistically thought I might be able to get round in 12 hours. Little did I know how much slower I’d get! By this point the weather was baking, and I couldn’t wait for the next swim. We got to the edge of Crummock Water, I topped up my sandwiches and swam over some scuba divers heading into the depths! Clive Allen (new Helm Hill recruit & work colleague) was waiting for me on the other side at Low Ling Crag. He’d drawn the short straw – leg 3 was just 5 miles but would take us 3 hours. As I swam to the shore, I could see him staring at Mellbreak with a look of confusion on his head. “You’re wondering which way we go up right?” I said, he said he was expecting to see a trod or something to suggest the way up! But no, it was straight up the steep, grassy climb to the left of the rocks (I’d tried the rocky gulley on a recce and decided it definitely wasn’t the best option!). 45 minutes of climbing in the stifling heat, we made it to the top of Mellbreak. From there, it was the reverse of the Buttermere Horseshoe to Red Pike. Onwards to High Stile, and then I totally messed up the descent. There is a path somewhere, but I recce’d it in 2016, and we didn’t find it! Instead we slipped, tripped and fell over lumpy scree and boulders, tussocks and hidden rocks. On arriving at Buttermere, non swimmer Clive ran straight into the water in his running stuff! I got changed and swam across to meet Jo W and Scully and leg 4 support runners Janie Oates and Ed Newcombe. Next up was the climb I was dreading – straight up the fence line from Hassness to Robinson. I’ve done it a few times in Breca Buttermere, but it was so much worse after 30 miles over the fells! From Robinson it’s pretty much the Anniversary Waltz fell race route to Catbells, I stumbled and swore my way across the tops (sorry Janie and Ed! ), and not quite able to enjoy the descents, I actually preferred the climbs! We dropped off a deserted Catbells (it was the world cup quarter final, hence on a beautiful Saturday afternoon, we saw no one on the summit!) and down to Derwent Water. I wasn’t quite on track for a 13:30 round, and was slightly [very] grumpy on meeting everyone at Hawes End. But they told me to get a move on, otherwise I might not break 14 hours. Rick Stuart was joining me on this swim, although he insisted he wouldn’t go in front as for me to draft him would be cheating. I left my shoes on for this swim as we had to cross three islands, Otterbield, St Herberts and Rampsholme. I felt dreadful at the start of the swim, but was like a new person on the other side (although I did need help standing up!). But once I was upright, Rick led the way and we stormed it back into Keswick in 13 hours 47 minutes. I so enjoyed that post Frog beer! I absolutely loved the whole experience of doing a challenge like this. I wish I’d been less worried about asking people for support. Everyone I asked just jumped at the chance to help. Extra special thank you to Jo W and Scully for their support all day, driving round runners and supplying me with food. 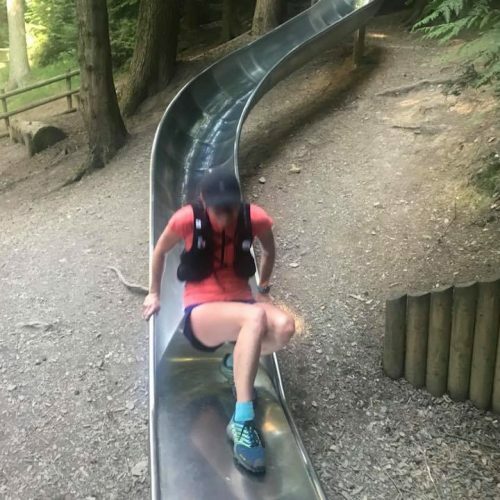 I can’t wait to have another go in 2019 – as my time was matched (well, beaten by a few seconds!) a week later, by Kate Charles. Oh, and the weekend was topped off on Sunday by heading back to Keswick to see Kilian Jornet’s Bob Graham finish. As well as the Frog Graham Round you also compete in some of the toughest Swim Run races here in the UK and abroad, with some very impressive results, particularly this year where you have finished on the top podium spot on numerous occasions. What is it you love about Swim Run? 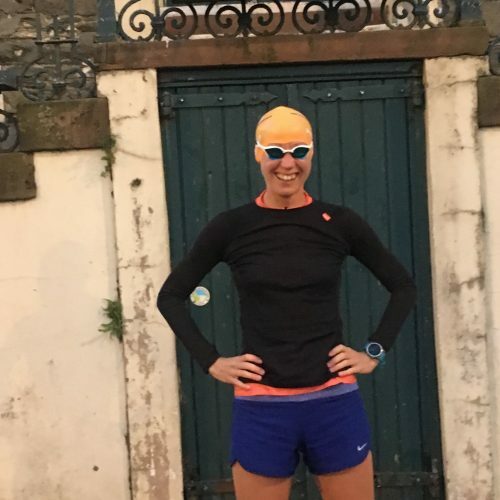 I used to do triathlons from the age of 17 to 22 but I just lost the love for racing as I would get annoyed if I didn’t get certain times – my mum would ask me why I was doing it if I didn’t enjoy it and so I just stopped racing, but carried on swimming, cycling and running for fun. 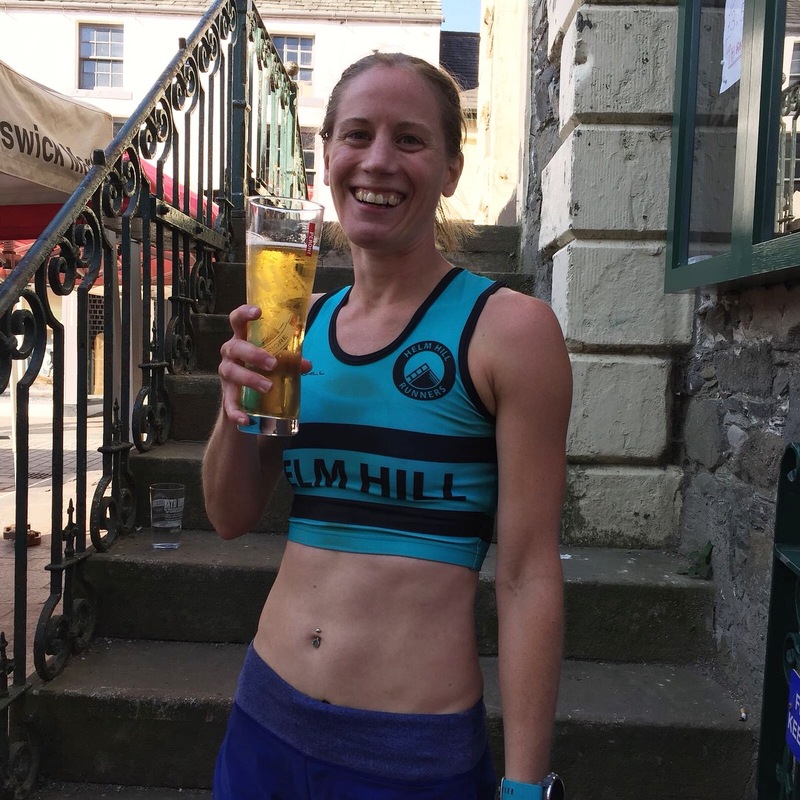 Over the next few years I ended up cycling Lands End to John O Groats, swam an English Channel 3 person relay and Loch Ness 6 person relay, and ran my first ultra – the 44 mile Classic Quarter from the Lizard to Lands End. 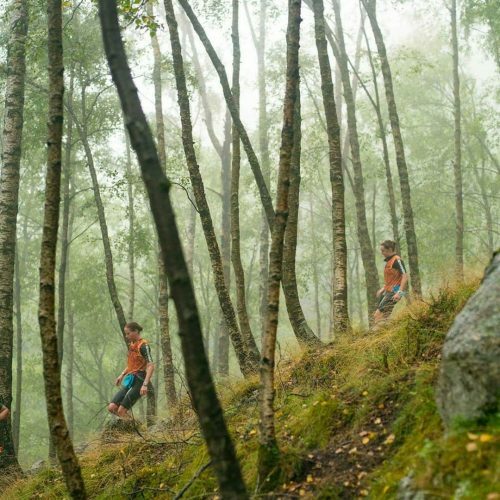 I think gradually doing these kind of challenges and events as experiences naturally led on to swimrun. A friend of mine, Dave Murray, was one of the first British pairs to race Otillo back in 2008, and he just raved about the experience. We contemplated doing it together but back then the cost was too much for me (around £800) as a student. Little did I know how popular it would become, and how hard it would be to get a spot in the original event, now the World Championsbips. 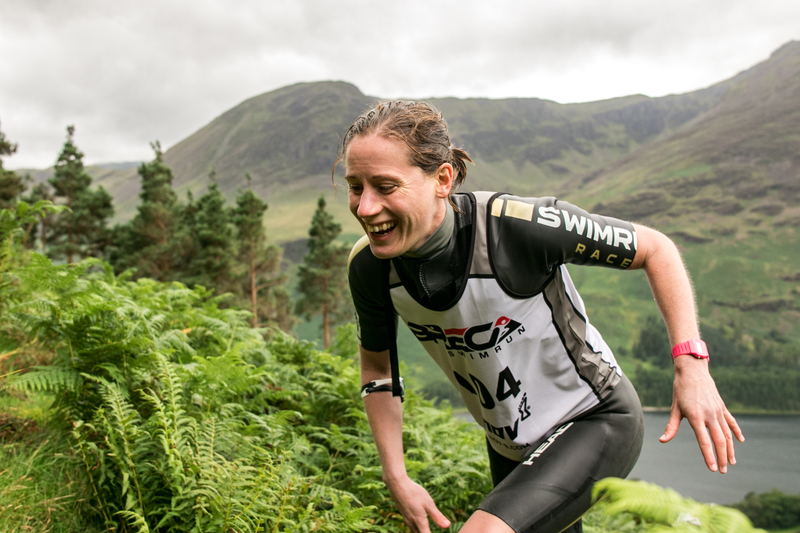 I forgot about swimrun for a few years, until Breca Buttermere was announced in 2015. 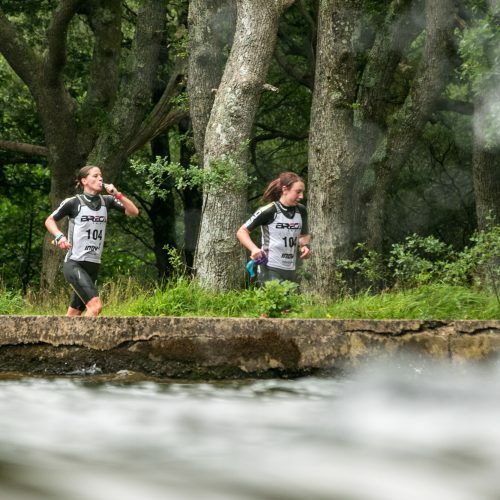 My friend Claire Wilson and I entered, and along with 13 other pairs, took part in the first swimrun in the UK! We fell in love with the sport, and the following year entered Otillo Isles of Scilly, where we ended up qualifying for the Otillo World Championships in Sweden. I particularly love the courses that are a real journey – linking up islands by swimming between them. They are also almost always in spectacular places, and from the water you get such a unique perspective of dramatic landscapes. 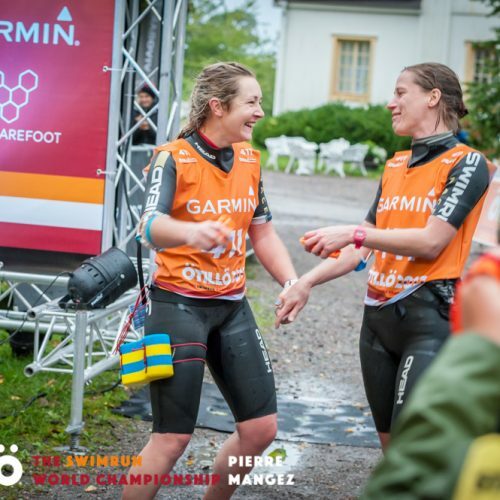 I also love the teamwork aspect to it, all the sports I do have traditionally been very individual, but as you race swimrun in a pair, you really need to work together. It’s really rrefreshing. What would you say most motivates you to take on such challenges? I just really enjoy them! 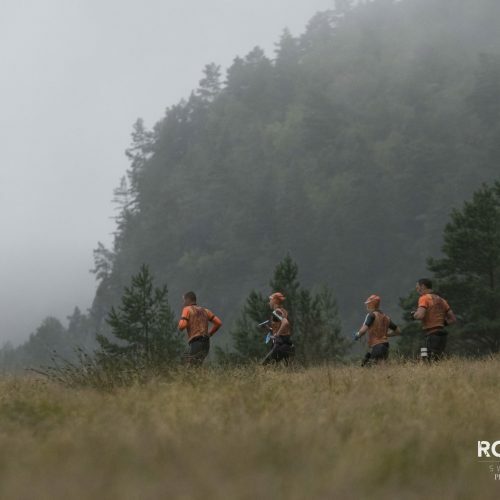 I love the physical challenge and the journey through mountains or coast paths, wherever the race happens to be. Although I’ve done well racing with my partners this year, I don’t really race for that reason. But doing well was a bonus this year! Has there been any particular highs or lows which stand out either during your Frog Graham Round or other Swim Run challenges? I really struggled with the swims in Otillo Isles of Scilly in 2016, I shivered non stop for the first half of the race, and convinced myself I wouldn’t be capable of doing the last 2km swim back to St Mary’s. Thankfully Claire (despite being cold herself) was full of positive words and encouragement and you know what, we were fine! 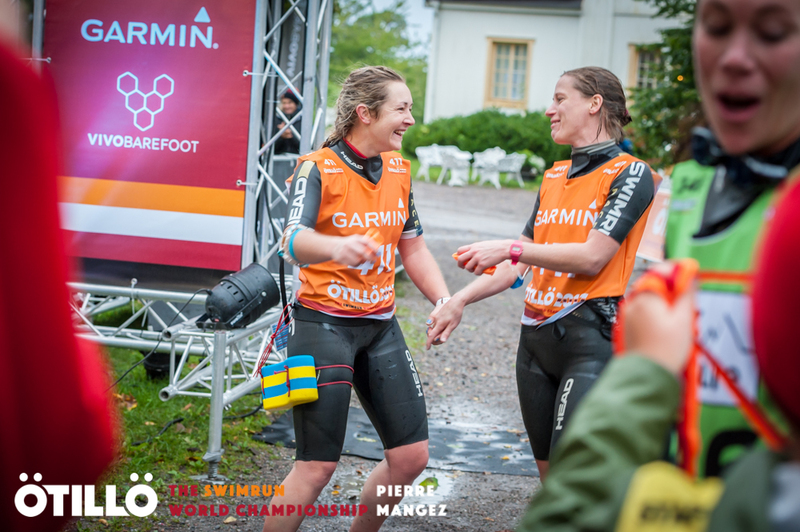 It just showed me how important teamwork is in swimrun. DNF’ing in Otillo Hvar in Croatia. 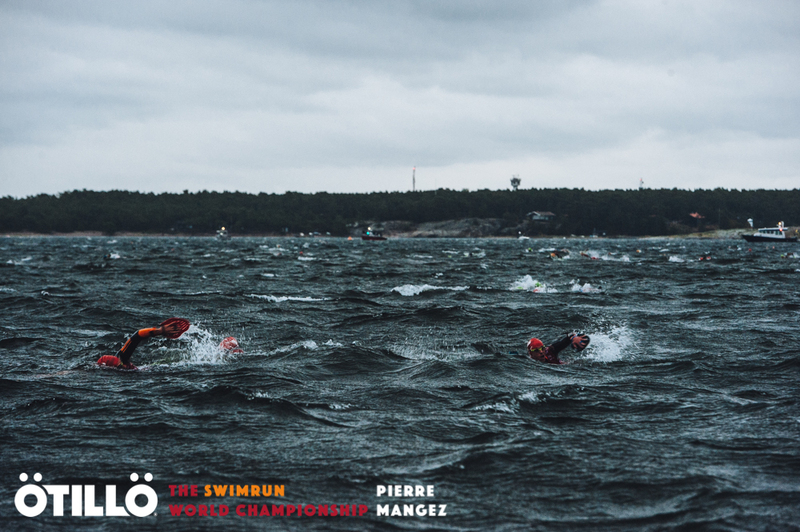 Gale force winds whipped up huge waves across the big 3km swim, Claire and I found it really hard to sight, and when we could see the islands, they were so far away they all looked like one land mass, we really didn’t know where we were going! It was quite scary, we felt very small in the big sea and often couldn’t even see each other, let alone the support boats or other swimmers. We made it to a little rocky outcrop about 2km across, where some other people had climbed out to get a better view and work out what to sight. We eventually completed the swim in about 1 hour 45 (it would normally take us an hour to do 3km). But a few hours later when we made it to a checkpoint, we were told we’d got timed out. Our first (and hopefully last) DNF! Only 50% of teams finished the race though, so we didn’t feel too bad! 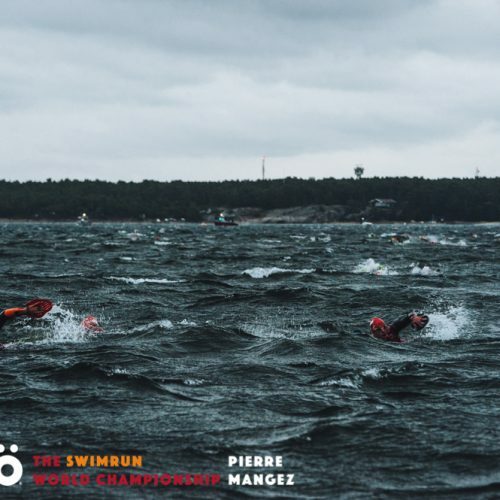 The Otillo World Championships 2017 had the worst and wildest weather in the history of the race. Cat and I didn’t sleep the night before – listening to the wind howling outside. It was the most cold and terrifying day I’ve ever had. 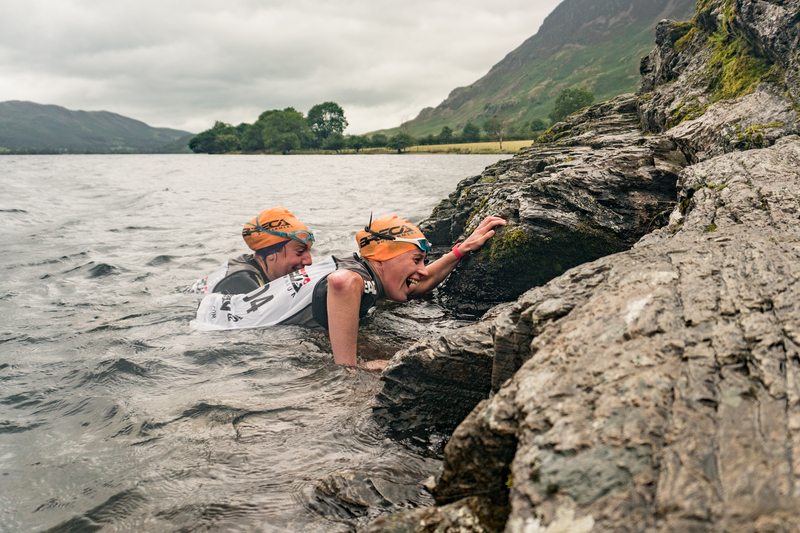 It was also Cat’s first ever swimrun after I managed to persuade her to partner with me as sadly Claire was injured so I felt somewhat responsible for her safety. Having told her it was all about the running, and the swimming was the easy part, I felt slightly guilty when we crouched on some rocks before the exposed ‘Pig’ 1400m swim, watching other swimmers jump in and get engulfed by the waves, and the support boats being thrown around in the sea. I was ready to quit then, and said to Cat, it was fine if she didn’t want to get in. She did. Damnit!! That swim was actually quite fun in the end once I embraced the unknown and which direction the waves would come from and whether they’d break on top of me! It was the next swim that broke me though, I hadn’t eaten enough, and bonked halfway through, but I was leading and sighting, so just had to keep going feeling like I was made of cold jelly. The longest 900m swim of my life! The final three swims across narrow channels were also the scariest swims I’ve ever done. It was only 20-30m across, but the water was flooding through like a river. We had to aim upstream and swim like mad to get across, or we’d get swept down to the safety boat waiting to catch swimmers before you got swept out to sea! Cat wrote a great blog on this race here. Finishing that same race. I’ve never been so happy or relieved to cross the finish line! The view from Priekestolen (Pulpit Rock) in Norway when I did Rockman Swimrun in 2016 with Claire Wilson. It was quite busy with tourists, but the fact we’d swum and then run there felt quite special. Cat and I didn’t get a view when we were there this year. 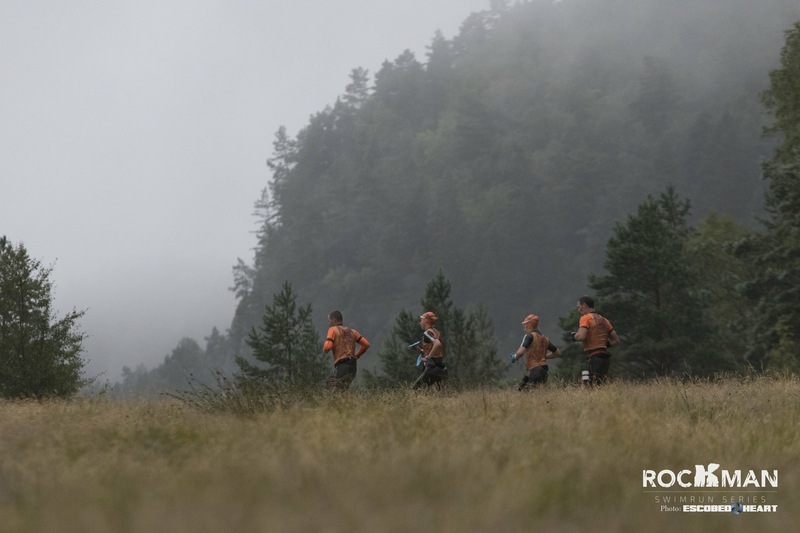 Rockman swimrun generally – it’s a really adventurous route, you feel a long way from anywhere, and the huge rock slabs, no real path over a lot of the mountains. Both times it’s been wet and water is pouring off all the rocks, it feels like a proper adventure. 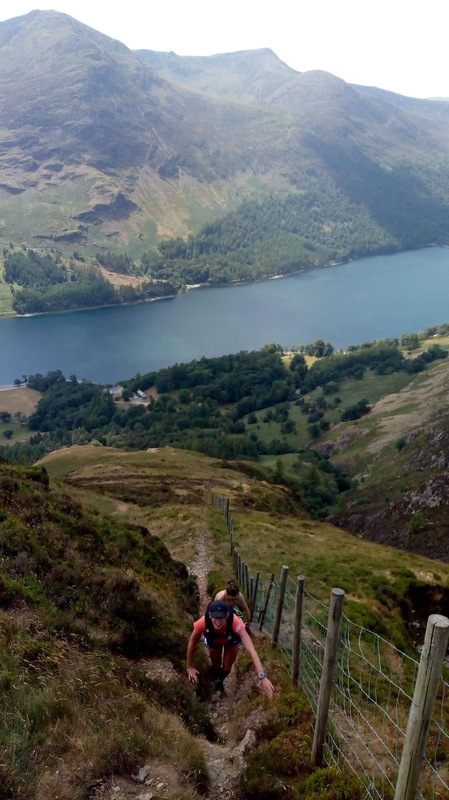 Any downhill running sections on Breca Buttermere, I just love it! And because Claire and I are both fell runners, that’s where we tend to catch people (but we’re not competitive, honest!). I’ve never been on the top spot of a podium before, but this year, I won 3 of my 3 swimruns with 3 amazing partners. 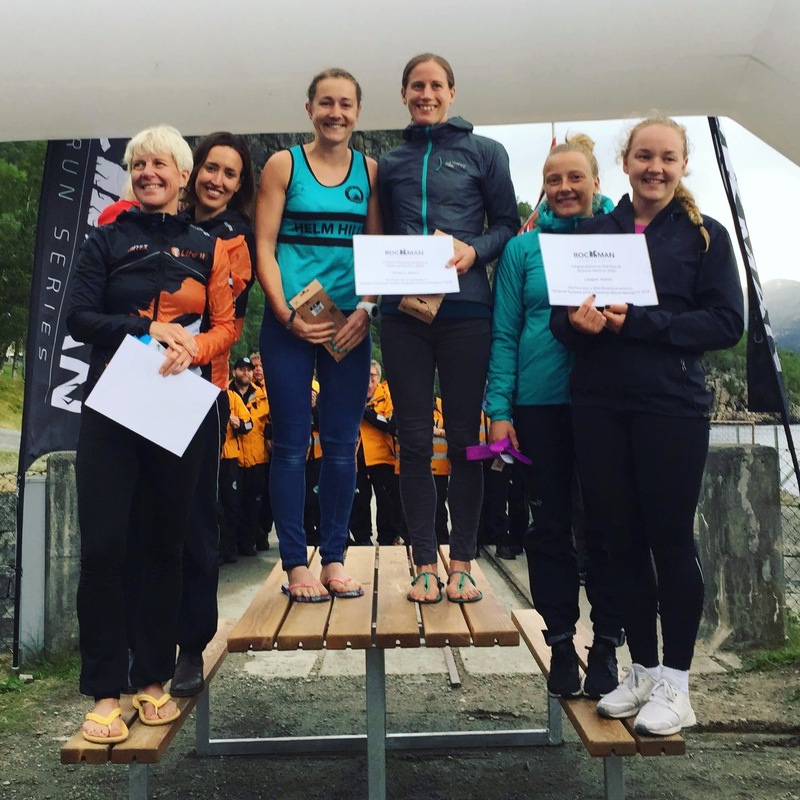 Rockman Swimrun in Norway with Cat, we had a great battle with 2 young (20 year old!) national Swedish triathletes. A week later I had no expectations of doing much and was in recovery mode, but Claire and I had a fantastic day out at Breca Buttermere, and won the women’s race. Then it was a cold day out with Rick Stuart at Breca Coniston in October where we finished first mixed team, but to me, more importantly, 5th overall. All of the Frog Graham Round, I just had an absolute blast. So many more, and infact, you could actually count my ‘lows’ as highs to, in hindsight! Actually, one more – this May I did the Hokey Cokey sprint swimrun in Cornwall with my mum, Susie Rice. She loved it, and it was really fun to partner with my mum! Do you have any tips for someone thinking of doing the Frog Graham Round or those looking to compete in their first Swim Run? The Frog Graham is very run heavy, the swims are relatively small part of it, but they are obviously significant if you can’t swim very well! 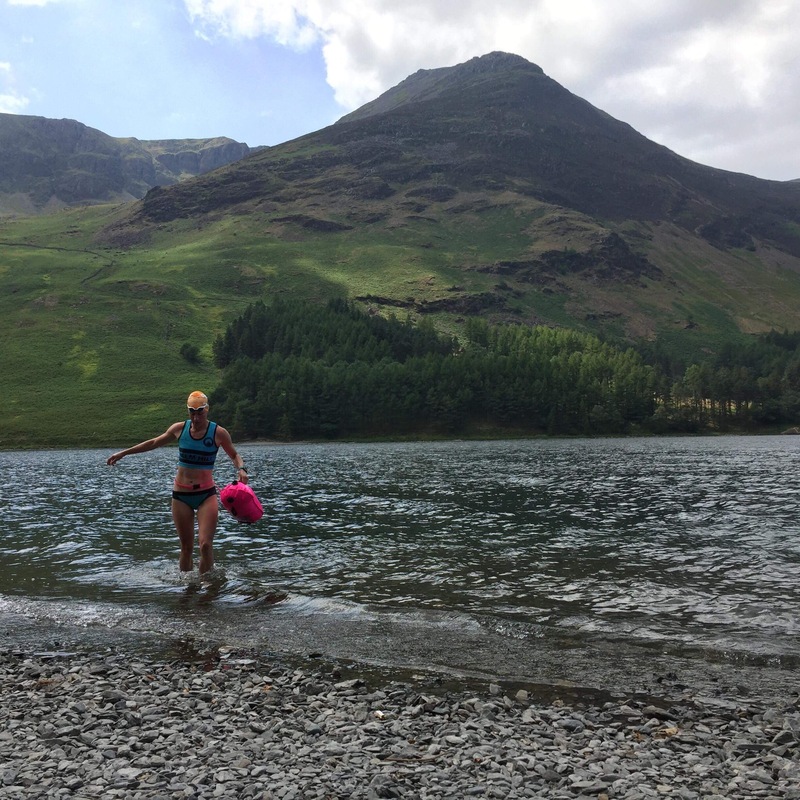 Maybe have a go at the Tadpole Round first – a 7 mile circuit from Buttermere, with 2 swims and 2 runs. It’s a perfect taster of the full challenge. 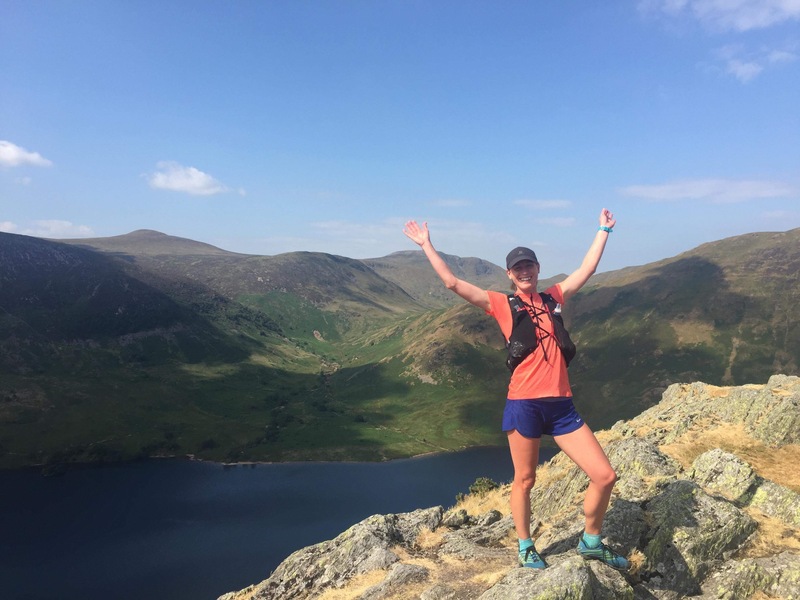 For fell runners, the running is perfectly do-able, it’s no-where near the distance or ascent of the Bob Graham, so as long as you are capable of the swims, even if you’re a steady swimmer, it’s an enjoyable challenge. If your background is more swimming, then it’s a serious undertaking. I’d start off walking in the fells, and build up your distance. The great thing about the challenge is that there is no time limit (unlike the Bob Graham). People can, and have, walked the whole route. 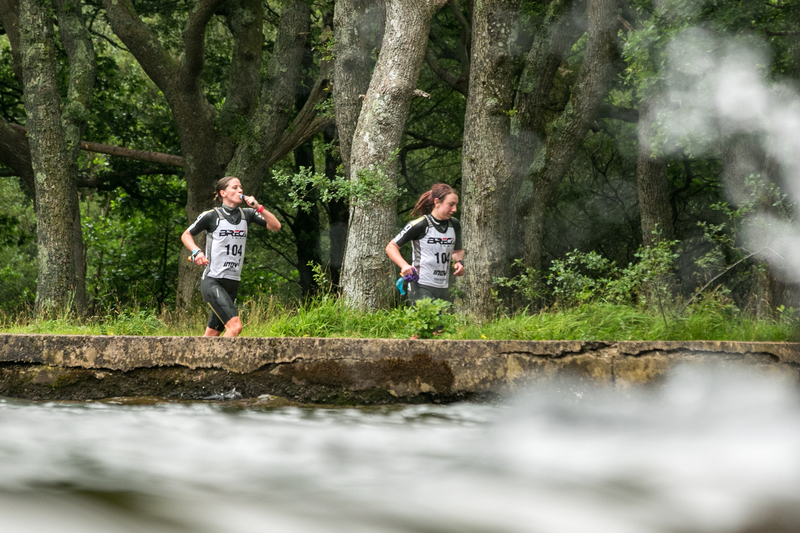 If you’re looking at doing a swimrun, it’s a lot more accessible now than it was a few years ago – ‘sprint’ races are options (which are more like 2-4 hours racing, rather than 6-12 hours!) Also, there are more races generally. 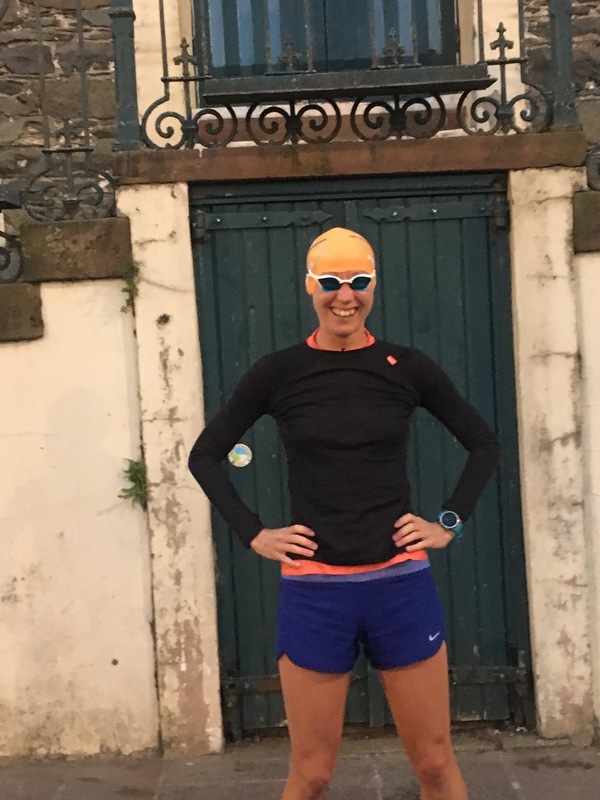 I think some great swimruns to get started are Hokey Cokey swimrun, Love Swimrun in Wales and of course, the Breca and Otillo sprint swimruns. Finding a partner can be tricky, I’ve been lucky to find 3 fantastic partners that I work really well with. I think it’s more important to find someone of the same attitude that you get on with, rather than trying to find someone whose times match yours in the pool or running 10km. Using a tether in the swim can help match your swimming. It’s important to practice together and learn each others strengths and weaknesses. Watch out for each other – keep checking your partner has eaten enough, is warm enough, the pace is ok etc. 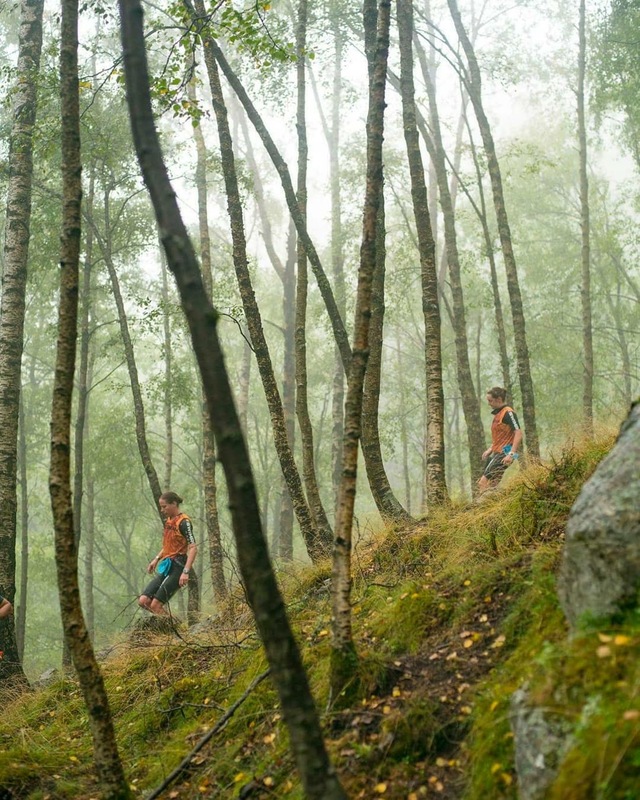 I’m keen to do as many fell races as possible this year, and especially the longer Lakeland Classics. I’m also doing my first ever Mountain Marathons: Marmot Dark Mountains with Cat Slater, and Scottish Mountain Marathon with Heather Ohly. Plus maybe Saunders MM with my husband Paul Scully, although we’ve been warned it’s not a good idea to do a Mountain Marathon with your partner! I’ll squeeze a few swimruns in, Breca Buttermere with Rick Stuart, and Breca Jersey with Claire.